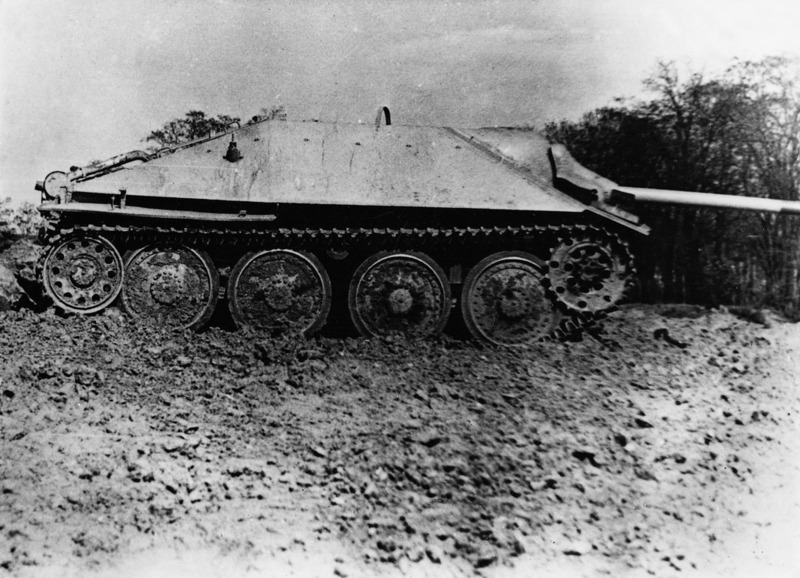 Manufactured from 1943 to provide the German forces with a dedicated Panzerjäger (tank hunter) capable of defeating the Allied powers’ latest armoured fighting vehicles, the Jagdpanzer 38(t) “Hetzer” (baiter) was based on the redesigned hull of the PzKpfw 38(t) light tank of Czechoslovak origins. The front, sides and rear of the superstructure were extended upward to a small horizontal roof by the acute inward-angling of the front, sides and rear to provide superior ballistic protection yet still providing a fighting compartment for the four-man crew. The lower part of the hull’s front was 60mm (2.36in) thick, angled at 40°, and was interlocked with the sides and upper nose plate, the latter also 60mm thick but angled at 60° up to the top of the superstructure. The primary armament was one 7.5cm PaK 39 (L/48) gun located some 0.38m (15in) to the right of the hull centreline, and fitted with an improved type of recoil mechanism permitting the muzzle brake to be omitted. The PaK 39’s elevation arc was -6° to +10° and its traverse arc was 11° right and 5° left of the centreline, and 41 rounds of ammunition were carried. One 7.92mm machine gun was supported on a mounting built into the roof and fitted with a periscopic sight and extended trigger mechanism. Production totalled 1577 vehicles.